The Black Hills Sprint Triathlon is the premiere sprint distance triathlon in the Pacific Northwest. Test your sprint speed on this fast course. The venue is Long Lake Park adjacent to the Thurston County Fairgrounds. The swim is in the flat, calm waters of Long Lake, followed by an all right-hand turn, 12-mile bike course. The run is a flat 5K with beautiful lake views. We’ll have your favorite rock music, participant t-shirts and a one-of-a-kind finisher’s medal, In addition to great swag, refreshments, rock music & a top-notch USAT Sanctioned Race course. June 9th, 9AM-noon, Long Lake Park. Swim Training, Transition Training & Kayak safety training. 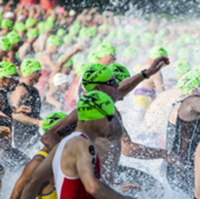 The Sprint Triathlon includes an 800-meter clockwise swim with a rolling start. Swimmers will keep the buoys on their right and sight to large, bright colored corner buoys. The water in Long Lake in very clean and calm. There will be plenty of local volunteers on kayaks for safety. Exit the water and run up a short grassy hill to the sound of up-beat rock music. Enter the transition area with two long rows of bike racks…designed to easily get in and out. The cycle course is now a 12-mile course – it’s not completely flat, but it can be quite fast. There’s one moderate hill to sprint up and the declines will give your legs a good rest and reset. The 5K run loops back to the swim start, which gives friends and family a great chance to see your speed! Get beautiful views of the lake and have a great finish right down the main entrance to the park. Challenge yourself and speed through the course or build a relay team of two or three…either way enjoy this well-designed course. The Duathlon starts by warming up with a short, flat .8 mile run out and back, then falls in line with the swimmers entering Transition 1. The rest of the course is the exact same course as the Triathletes. 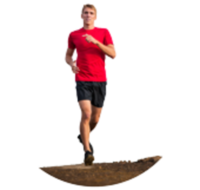 Duathletes may have up to two team members or complete the entire course solo!